The holiday season is over, Christmas gifts have been unwrapped long ago, and now we have to go back to our daily routines. How depressing, isn’t it? Well, not everything is looking so gloomy! Despite the reality check we all undergo when the holidays are over, New Year is a time well known for the biggest aspirations and life-changing decisions! Yes, as we all know, making a list of New Year’s resolutions is a must-have these days. Quitting smoking, starting a healthy diet, joining the local gym, spending more time with your family and friends and quitting the job you truly hate are just a few of the more popular ones. There can be dozens of more resolutions, of course, depending on your personal circumstances. Given the fact, however, that you’re reading a blog about English fluency improvement, I don’t think I have to take a wild guess to figure out that one of your New Year’s resolutions might include improving your English, am I not right? And, if you’ve been a follower of my blog for some time, the chances are that you’re going to focus specifically on SPOKEN English improvement because that’s what I’ve been reiterating on my blog posts and videos ad nauseam! 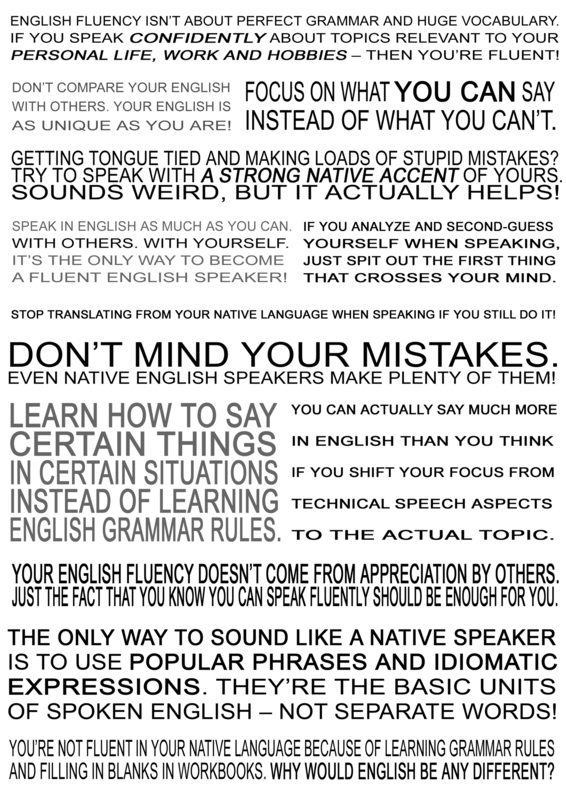 Anyway, here I’ve prepared a poster with useful pieces of advice and motivational quotes for anyone who’s serious enough about their spoken English improvement and is going to make it one of their New Year’s resolutions. 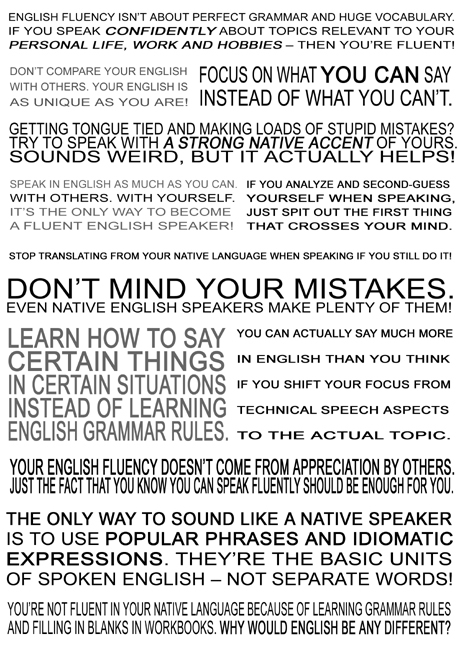 Print it out and stick it up on the wall so that you can look at it every day to remind yourself of the most important aspects of true English fluency. It will also serve as a strong motivator at moments when you feel down or when you experience one of those drops in your English fluency I’ve discussed in detail on this blog post and also here. I’m regularly sharing new articles and videos on this blog, just go to the home page and start reading! You’re welcome Khushi, and keep up the good work! hey Robby. Good Day. I’m interesting in your English harmony.but i dont have any idea of that.and Thank you for your YOUTUBE videos and blogs because im one of them of hard to speak english.and some of grammar rules sometimes i forgot. No problem, and many Happy Returns to you!!! Thanks Robby for your efforts, and happy new year!